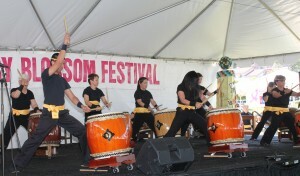 Members of Yuujou Taiko played their drums as they welcome everyone to Monterey Park’s 16th Annual Cherry Blossom Festival held in Barnes Park on April 20 – 21. They performed several folk songs to the delight of the audience. 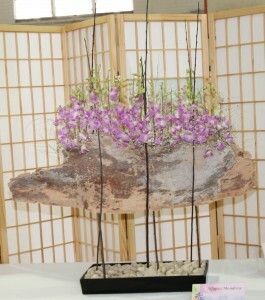 The Cherry Blossoms are a sign of friendship and the beginning of spring in the Japanese culture. 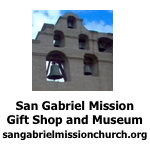 The event featured International food booths, information booths, as well as booths selling fresh fruit, candy, vegetables, clothing, art, jewelry, music and more. Karen Ogawa, Chairperson of the committee welcomed all to this event. She thanked the residents for their support. She thanked the donors for their support. She wished everyone a good day. Members of Mark Keppel High School Aztec Singers entertained the crowd with several songs and dances. Rodney Kageyama welcomed every one to this special event. 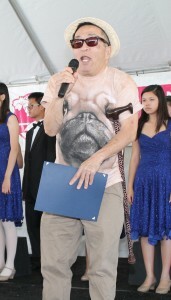 He is enjoying this event and will be back next year as the Master of Ceremony since he just had surgery. Mayor Teresa Real Sebastian, Mayor Pro Tem Anthony Wong, Councilmembers Hans Liang, Peter Chan and Mitch Ing, City Clerk Vince Chang, City Treasurer Joseph Leon are joined by Frank Buckley and Susan Hirasuna in welcoming the residents and their guests to this wonderful celebration. Mayor Real Sebastian said in 1912 the Japanese government sent cherry trees to Washington, DC as a symbol of their friendship between the two countries. We are united. 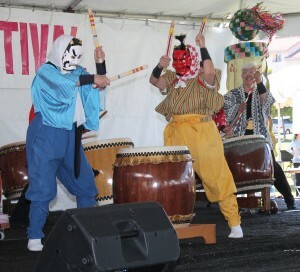 We are fortunate to have the Japanese culture in Monterey Park. 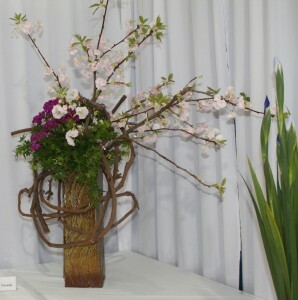 This event celebrates the start of spring with new opportunities and friendships. Mayor Pro Tem Wong welcomed all to the beautiful city of Monterey Park. You are all beautiful. He thanked all of the volunteers. Enjoy yourself with the entertainment and good food. Councilmember Liang also welcomed everyone to this festival. He thanked the residents, committee and the volunteers for participating in this event. Councilmember Chan also welcomed all to this event. This is his first time on the stage. Enjoy all of the festivities. The Cherry Blossoms welcome spring. Enjoy. Councilmember Ing also welcomed everyone to this event. The Council had participated in the Earth Day bike ride earlier. He spoke about the recent tsunami when all of the residents shared their food and water with each other. They are one body and one community. He thanked all of the guests. 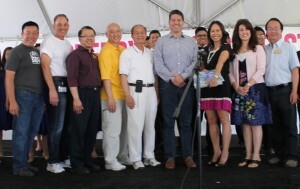 City Clerk Chang also welcomed everyone to the Cherry Blossom Festival. It is his favorite. Please visit all of the booths. City Treasurer Leon stated as the treasurer his has attended this festival for the last six years. This is a great event. Enjoy. Mr. Buckley shared his family history that his mother is Japanese. He spent several years living with his parents in Japan. He joked that he did not realize that he was European too as a child. He spoke about reporting on the tsunami for KTLA and the devastation that he witnessed. He is happy to report that the residents of the devastated area are putting their lives and cities back together. Ms. Hirasuna spoke about growing up Japanese in Los Angeles. In 2012 she traveled to Japan to speak to the residents of the devastated area for KTTV FOX 11. She brought back their stories of resilience and fortitude. 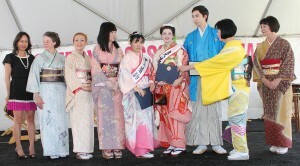 Susan Hirasuna introduced Mr. Kimono 2013 Andrew Reeder, Miss Kimono 2013 Lucia Scriven and Miss Kimono 2013, First Runner Up Kieko Terashima to the audience. They were dressed in traditional Japanese kimonos. 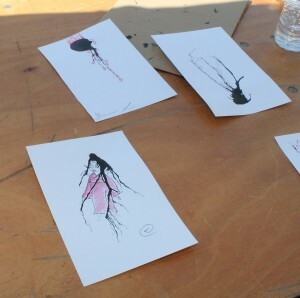 Artists created pictures using black ink blown through a straw to create cherry blossom trees and used a pink marker to add the blossoms at the Library booth. 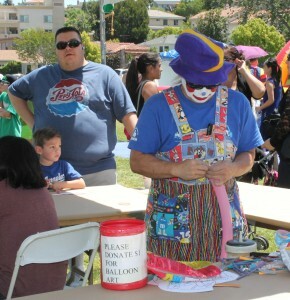 A clown created balloon toys and flowers for the children in the Kid’s Zone. The children also colored in pictures on fans and paddles of their paddleballs. 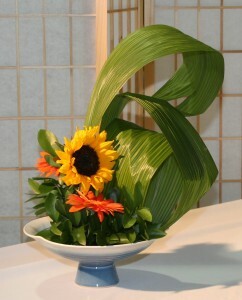 Flower arraignments were judge for their color and splendor. Flower arraigning is an art. 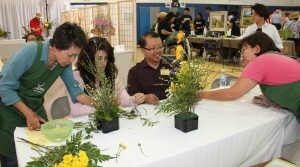 Councilmembers Real Sebastian and Ing taking lessons on how to create beautiful flower arraignments. 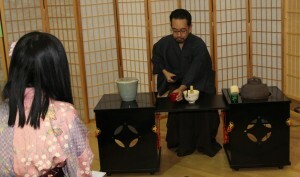 A formal tea service was held for the guests. 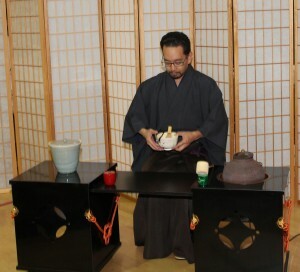 The history of tea was presented as tea was imported into Japan from China. At the formal ceremony each action has a history. Tea is always served with a sweet to cut the bitterness of the tea. 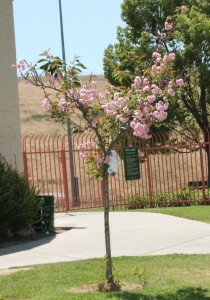 Monterey Park’s cherry trees are planted in Garvey Ranch Park. They bloom beautiful pink flowers in the spring. 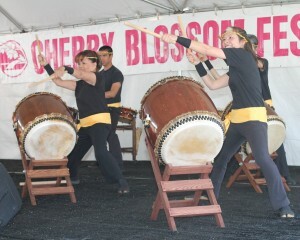 The Cherry Blossom Festival is one of the favorite celebrations of the residents and guests in Monterey Park.